Bad news for Spenser fans. Not only is the Boston private eye out of place in London and other European capitals. Not only is he caught in a second-rate, linear plot (hired by a rich American to hunt down the rightist, racist terrorists whose bomb killed his family and put him in a wheelchair). But worse yet, Spenser's lady Susan--who's been so attractively integrated in previous cases--is brought centerstage so that Spenser can go through some embarrassingly mawkish Hey-babe-I-love-you stuff. What a downer. 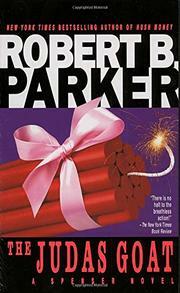 True, Parker always writes a zippy page and Spenser's humor surfaces here and there. He says to the nymphomaniac moll who reluctantly leads him to Montreal, where the gang is about to be evil at the Olympics: "Kathie, you gotta find some other way to relate with people. Killing and screwing have their place but there are other alternatives." The smiles are few, however, and the expected Parker texture nil. Hey, Spenser, go back to Boston where you belong and, for Pete's sake, stop whimpering!